Could We Reverse Alzheimer’s Symptoms by Restoring Epigenetic Balance? | What is Epigenetics? Fascinating new research out of Drexel University suggests that restoring balance to certain epigenetic enzymes might reinstate memory and lead us closer to a potential therapy for Alzheimer’s disease. This devastating type of dementia causes issues with memory, cognition, and behavior. Could epigenetics help reverse symptoms and bring back cognitive abilities in those with Alzheimer’s? The symptoms usually appear gradually and worsen over time, such as memory loss, difficulty planning or solving problems, and confusion with time or place. According to the Alzheimer’s Association, there is no cure for this disease, which over 5.7 million Americans are currently living with. In the early stages of Alzheimer’s, individuals experience cognitive impairment, including difficulties with memory and learning. Studies have shown that it may be linked to elevated levels of an enzyme known as histone deacetylase 2 (HDAC2). This epigenetic enzyme aids in the control of the expression of synaptic genes related to memory and learning. Histone deacetylases remove acetyl groups from histones, which tightens the chromatin structure consisting of DNA and histones. By allowing the histones to wrap the DNA more tightly, gene expression is reduced. Interestingly, it has been previously reported that protective epigenetic marks go awry in Alzheimer’s disease, specifically histone modifications. Drosophila, or commonly known as fruit flies, were used to model Alzheimer’s in this study. Credit: Drexel University. In this case, when HDAC2 is more abundant than the enzyme it’s paired with, referred to as Tip60 histone acetyltransferase (HAT), gene expression is repressed and issues arise with neuroplasticity, or the brain’s ability to adapt to novel stimuli with new neural connections or recall reactions it previously experienced. A group of researchers led by PhD student Priyalakshmi Panikker along with Associate Professor Felice Elefant, PhD from Drexel’s College of Arts and Sciences conducted tests on Drosophila flies with symptoms representing Alzheimer’s. Ultimately, they discovered that they could restore the balance of the epigenetic enzymes. They did this by adding extra Tip60 HAT in the flies’ brains, which allowed the flies to re-learn and remember behaviors they were previously taught. “Our findings strongly support the concept of exploring the efficacy of specific Tip60 HAT activators, as well as identifying and manipulating additionally misregulated Tip60 target genes,” Elefant said. Their study was published in the Journal of Neuroscience. The research team investigated flies that modeled Alzheimer’s disease and how they were affected by it during early development – at the larval stage – in order to see what may be happening long before symptoms were present. Elefant commented that most scientists use post-mortem human samples when looking at Alzheimer’s disease, which means that they can’t assess what’s occurring during the progression of neurodegeneration early on or see if they might correct it. 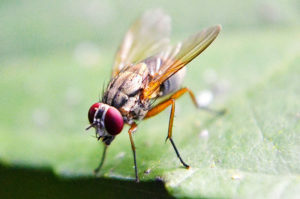 In the study, the team taught flies to associate a particular scent with sucrose, also known as table sugar, which they consumed and acted as a positive reinforcement. Over time, the flies learned to advance towards the odor even in the absence of the sugar. The flies with Alzheimer’s symptoms had no change in reaction to the scent that they had earlier been conditioned to, which showed the negative effect on their capacity to remember and learn. However, once the Tip60 HAT was administered to the Alzheimer’s flies’ brains, they demonstrated reaction time that was similar to healthy flies. This suggests that after the epigenetic balance was re-established, the flies recovered their cognition abilities. Furthermore, they identified a group of genes linked to brain function that was repressed as a result of increased HDAC2. When they increased Tip60 HAT levels in the brain, regular function was restored in 9 out of 11 of these genes. The results found using Drosophila are encouraging, but further investigation needs to be conducted to explore the implications that restoring this epigenetic balance may have for humans who might develop Alzheimer’s disease. Source: Panikker, P. et al. (2018). Restoring Tip60 HAT/HDAC2 Balance in the Neurodegenerative Brain Relieves Epigenetic Transcriptional Repression and Reinstates Cognition. The Journal of Neuroscience, 38(19): 4569. Reference: Otto, F. Restoring Epigenetic Balance Reinstates Memory in Flies With Alzheimer’s Disease Symptoms. Drexel University. 14 May 2018. Web.